I purchased one of these this week and having played with it for a few days I have to say it is a great addition to the Raspberry Pi. It is the "Adafruit RGB Negative 16x2 LCD+Keypad Kit for Raspberry Pi" available from the Adafruit website here for $25 plus postage. Which compared to the price of the Pi seems expensive, but this seems to be an issue with all accessories, as the Pi is just so cheap. For me the extra functionality this add on brings seemed well worth the money. As its name implies it comes in a kit form which you have to solder together yourself. I had not done any soldering before, but the Adafruit website claims "Assembly is easy, even if you've never soldered before and the kit can be completed in 30 minutes." and I can attest that I assembled it with no problems although I think it took me more like two to three hours than the 30 minutes (I assume that is the estimated time for someone more experienced at soldering). The kit basically consists of a circuit board which is identical in size to the Pi and assembly involves soldering all of the components onto that board. Once completed you have a unit which sits on top of your Pi connecting to the GPIO pins on the top left corner and resting on the ethernet port on the bottom right corner. (When the model A is released early next year I guess that Adafruit will have to add some more parts to the kit to make up the height difference for the missing ethernet port). You get a two row text display with sixteen characters on each line and a back light which you can change the color of for the whole display via code. There are also five input buttons in the bottom left arranged in a directional pad configuration with a select button to the one side. These look like they will be great for all sorts of projects, removing the need for a full keyboard, but in combination with the screen offering a full range of interaction with your projects. My only slight criticism (and indeed my only criticism about the whole product at all) is I think these would have been better in the bottom right corner where the board is supported by the ethernet port. Where they are, it feels if you pressed the buttons too hard it could dislodge the board from the Pi. But to be fair I know nothing about circuit board design and me saying "can't you just move that bit over there?" about something which might be in fact quite difficult, could well be a rather unhelpful comment. Maybe this could be a 3D printing project for someone to build some sort of support for that corner? Once you have the board assembled and connected to your Pi it is time to get some code running on it. There is some sample code to get you started on the Adafruit website here. I found it did not work for me first time and I had a panicked moment of thinking my soldering job was not up to scratch. But after a quick Google of the error message I found it was in fact something I could fix from the software side of things. In fact just re-reading the instructions as I write this, I realise I missed the very first instruction: "edit /etc/modules (sudo nano /etc/modules) and add: i2c-bcm2708 i2c-dev to the end of the file. Then save and reboot to enable the hardware I2C driver.". So if it doesn't work first try for you, try what I did not bother to do and recheck that you followed all of the instructions! After that try a Google search on your error message and then an inspection of your solder work. My first actual useful project with it was to get my Pi to display its IP address when it boots up. Great for being able to remotely connect into it without connecting a keyboard or monitor. When I have time I will write up a full step by step guide on how to get this working. Sooner or later one of your projects is going to need to store some data; and what better place to store that data than a database? This post is going to run through the basics of what you will need to do to get started with databases on your Raspberry Pi. To do so I am going to make use of a database technology called SQLite. 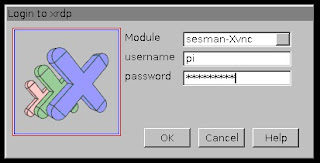 Python comes with built in support for connecting to it. Databases are stored in a single file which you can directly connect to from your code, without the need of a running server process. And yet a serious product being used in many well known products such as Mozilla's Firefox web browser. Check this page out for a full list. Obviously SQLite may not be the perfect choice for every project and if you want to read up some more about if it will be suitable for your particular project check out the Appropriate Uses of SQLite page on their website. But I suspect that SQLite will be a good fit for many projects on the Pi. Wait while it downloads and installs; and you are done. and that is it; you have created your first database and are connected to it. There is one slight caveat to this. SQLite has not yet actually created the database file, so if you were to exit SQLite now and look for MyFirstDatabase.db you wouldn't find it. Why? Well we haven't created any content for our database yet and with no content what do we actually have? So let us start adding some content. First we need to create the table and then we need to add the data into that table. To do both of these tasks we are going to use a language called SQL. "Wait a second..." I hear you say. "I thought we were already using SQLite, now we need another SQL? And what's the difference?" OK, good question. SQL stands for "Structured Query Language" and it is a language much like Python is a language. Though not strictly a programming language in the traditional sense, but specifically tailored for querying data. SQLite is a program which let's you run SQL commands, much like the Python editor on your desktop will let you run a Python program, but also provides the whole mechanism of what to do with those commands. SQL is found in industry applications such as SQL Server, Oracle, MySQL and many others. Every program has a slightly different flavour of SQL, but the basics will be the same across all of them and well worth your time to learn. As a helpful note, all commands in this blog post in blue text are SQL commands and should be entered at the sqlite> prompt. Any commands in red text should be entered at the standard Linux command line $ prompt. Don't forget the semicolon on the end. If you do (as I always seem to) just put it on the next line and press enter. That's it, you've just created a table called fruit. Well fruit is the name of the table that we created and what we will use to refer to the table when we want to put data in and get data out of it. name, calories and price are the names of the three columns; TEXT, INT and NUMERIC are the datatypes for the corresponding columns. For anyone who has used any other SQL database engines in the past it is worth noting here that SQLite uses a dynamic data type system. This means you can actually store any type of data in any column. The data types that you define when you create the table are merely recommended data types and do not enforce the type of data which can be stored in a particular column. A more detailed explanation can be found on the SQLite website here. Well now we have a table the next step is to get some data into it and again we are going to do this using SQL. Great now our table has three rows of data, but how do we check what is there? To see what data is in a particular table we use the SQL select command. returns just the Apple row of data. The SELECT statement is really one of the cornerstones of the SQL language and these are just some very basic examples of what you can do with it. If we want to remove data from our table then we can use the DELETE command. will delete all of the rows in the fruit table. TIP: If you want to re-add the data you just deleted, a quick way to do this is to press the up arrow on the command prompt to get back the insert commands you initially used to add the data and just press enter on each one to run that command again. Look out for my next blog where we will look at how we can connect to our database from Python. Essential if we want to start making use of databases in our projects. In starting up again I wanted to look at the reasons why I hadn't done more. I am still very excited about the project and the device, so it is not lack of interest. I feel like saying it was a lack of time and although work has been busy these last two months (with a major release now only days away) it's not fair to say I have not had time for other interests. So what I am putting it down to is location. I have read the debate that the cost of a Pi is actually significantly more than $35 as you need a number of accessories before it is a usable computer. The counter to this argument (which I am generally in agreement with) is that many of the extra accessories you will need, people will find they already own. Very specifically in this area and the most expensive accessory you will need is a display device. But here is where I am beginning see a flaw in the argument and why I've not played with my Pi more. I agree that most households (mine included) will have a HMDI enabled display in the home. The problem I have, is this display is the television sitting in the living room. Which has a number of intrinsic problems. Firstly it is on a television stand, so when the Pi is connected to it you have to sit on the floor in front of it, which is not the most comfortable of positions. Secondly when the Pi is all wired up in the middle of said living room with wires sticking out from it in all directions it doesn't really add to the ambiance of the room. This meant I was packing it away between uses, which had the knock-on effect of I couldn't just play with it for 15 minutes as it took about that long to get it set up and put away again. And the last problem of using the television is that it is actually used to watch television on! So it was not like I could play with the Pi while watching some mindless TV show. 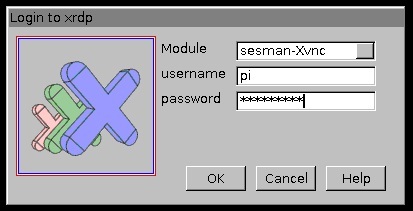 But I am all about solutions to problems and in starting again with my Pi this seems like the biggest one to address. And my solution? 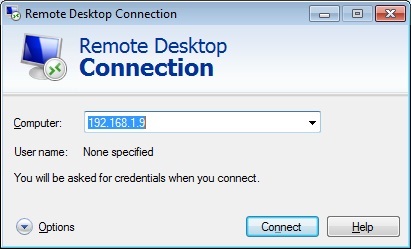 Remote Desktop. I got it successively installed last night and can now remote from any of my other machines to the Pi. This has already paid dividends with me getting further with my GPS project than I had before all from the comfort of my bed. 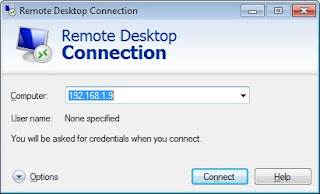 Look out for a blog post on how to set up Remote Desktop for your Pi coming soon. One of the things that excites me about the Pi, is the ability to use the GPIO pins to control external devices. Now I don't have much of an electronics background so this is all going to be pretty new to me. I thought a good place to start was the article in the second edition of MagPi (the Raspberry Pi magazine which is an excellent read and I think compulsory reading if you are interested in the Pi). Well, following my Radio Shack visit I have two pieces of advice for you. Firstly if you want the sales assistants to leave you alone in Radio Shack then hang out in the electrical components section. I'm sure if I had been looking at mobile phones I would have had multiple people ask if they could help me, as it was I got a pointer to the area of the store I needed as I walked in and then while I searched through draws of components for a good twenty minutes, nobody asked me if they could help. Next time I'm in there looking at phones and someone asks if they can help me, I'm going to make sure I have a nasty electronics question ready for them. Which brings me to my second piece of Radio Shack advice: These are NOT the right parts! As it happens I have managed to use them to hack a solution out of, which will do for now, but it's not one I'd recommend so I'm not going to go into the details of it here. When I have a more permanent solution I will let you know. I hooked up the circuit, following the digram from the magazine and fired up the RasPi. Nothing went pop and there was no black smoke so all good so far. Then I pressed the button and still no black smoke, but the faint shining of the LED; looks like I got it right! At which point I get an error message about not being able to download a requirement. Looks like my Pi needs the net after all. So I do actually have a network cable, the only issue with it is the length. So the router gets pulled out from behind the sofa and into the middle of the room and then moving the Pi away from the monitor a bit gets the whole thing to reach. Plugging the cable in makes some new lights light up on the Pi and then rerunning the command above works. Next step is to create my Python program. I manage to create the text file using the right click menu then using open with, I find my OS has a python editor pre-installed, nice! What!?! Python cares about how I lay out my code? Python reads whitespace? Surely not? But yes, indeed Python does care about indentations. Interesting... I do see why this could be a good thing to enforce a standard coding style, but it worries me that there is code that I cannot see. But removing one of the tabs from the line "<tab><tab>if mybutton == False:" fixed the problem and I had a working program which I was controlling with an external switch. This is something I have been interested in doing for many years and have never even come close with any of my previous computers. With the Raspberry Pi, I have a working prototype in a single evening. Impressive stuff! My Pi is here! Very exciting. So looks like I did everything right with the SD card, as it all booted up without issues. Pictures of my board are here. My two initial observations were just how small the thing actually is (I know I knew it was the size of a credit card, but it still seems amazingly small when you actually have it in your hand) and the second was how strangely satisfying it is to have a machine which boots to a command prompt. Though I must admit I did spend a few minutes staring at said command prompt wondering: now what? A little bit of digging in the wiki found the startx command and I booted into the GUI in no time. So in terms of the accessories that I had, they all worked with no problems at all, just plugged them in and I was away. I think I need to change the local to recognise it is a US keyboard, but thankfully I still remember where all the keys are supposed to be so didn't bother changing it at this point. My Amazon order arrived on time and all looks good. I will say that the keyboard looks better on the web than perhaps it actually is. In reality it is what I would expect for the price: nothing amazing but perfectly functional. So I think I am ready for my Pi! Fingers crossed I did everything right! Oh and I think I have decided on my first project. A GPS enabled car computer. Watch this space for details.